Most everywhere in small town America local folks can provide names of favorite sons and daughters who left town to make a positive impact on the wider world. Many would like to think that youthful experiences born of rural community experience instill values of cooperation, hard work, and service to others that are evident in the lives of those who remain and others who head off to make lives elsewhere. Those of us raised in places like Endicott and St. John, Washington, heard many times about the exploits of locals raised on area farms who went off to distinguish themselves far beyond the rolling hills of the Palouse Country. I remember taking my E-SJ Middle School students in the 1990s to interview Carl Litzenberger, whose grandfather, Henry, was among the founders of our Palouse Colony Farm in the 1880s. Carl and his brothers were quite the adventuresome spirits and he told us about seeing a biplane fly over the Union Flat wheat field where he was working one day and deciding right then and there that we would do that someday. And so he did—studied blueprints, ordered parts, and built the thing with his brothers in their barn back about 1918 to become a true barnstormer. Carl became acquainted with Emelia Earhart, Pancho Barnes, and host of other Roaring Twenties celebrities before another career of training World War II Army Air Corps pilots. He eventually served as a private pilot for political leaders back East before returning to the Northwest. There are many tales like this to share, but one of the most notable individuals to hail from our home was Washington Mike Lowry—born in St. John and a graduate of Endicott, who served in Congress in the 1980s and as Washington’s governor in the 1990s. Mike’s parents were vital members of the community as Bob managed the local grain growers cooperative in the 1950s while Helen taught school in nearby LaCrosse. I remember well when Mike returned to Endicott in 1992 for a downtown rally at which he announced his candidacy from the back of a wheat truck. Not long afterward in the wake of the Soviet Union’s collapse, Mike helped in significant ways to facilitate the Operation KareLift project that provided Northwest food and medicine to children’s hospitals and orphanages throughout the Russian Far East. We were saddened to learn of Mike’s passing this past spring and joined in a celebration of his life at St. Matthew’s Lutheran Church in Renton near Seattle last May. Washington’s former governors were attendance along with other leaders who offered eloquent remarks on Mike’s longstanding commitment to the less fortunate. For me the most memorable reminiscence came from Pastor Kacey Hahn who recalled how last fall she asked for volunteers from the congregation to help with arrangements for a month-long tent city on church property for area homeless. She remembered that Mike had been among those who raised his hand but thought little more about it until coming to work early one weekend and hearing loud whistling from the downstairs laundry room. She investigated and found Mike making music while folding a mountain of clothes from the newcomers. At the memorial service Pastor Hahn asked how many retired politicians, or those from other walks of life, would spend time in such anonymous service, or as volunteer advocates for migrant farmer housing and the host of other humanitarian causes Mike so fervently pursued. As I continue to compose my treatise on harvest motifs in agrarian art and literature, my thoughts have turned to their use as political campaign slogans and images. The transformation of America from the land of self-sufficient yeomen to commercial farmers using labor-saving equipment took place throughout the nineteenth century when the rural populace still worked hard and sought land ownership, but depended increasingly on cash crops transported by newly constructed railroads to Eastern and foreign markets. The concurrent advent of improved agricultural mechanization fostered larger farm acreages and greater need for communities with bankers, merchants, grain brokers, equipment dealers, blacksmiths, and workers in other businesses and trades. The time increasingly witnessed a shift in rurality from small-scale farming as an end itself to consolidated land holdings that supported an array of local businesses, and held land value in similar regard to the old attachment to the land itself. Yet the agrarian myth of diligence, honesty, and independence had enduring appeal and remained a powerful symbol of the nation. Vermont genre artist Junius Brutus Stearns (1810-1885), famed for his series on the American Founders, depicts a harvest scene in George Washington—Farmer (1850) in which the president, a reincarnation of the Roman general Cincinnatus, is clad in formal wear while conversing with his overseer as grain is cut by Mt. Vernon’s slaves. The symbolic scene is inspired by ancient writers like Hesiod, Virgil, and Horace whose writings in praise of husbandry formed the basis of a classical education for American upper classes, but overlooks the brutal realities known to toiling workers deprived of opportunity to own land. Cereal grains were raised in the South to a much lesser extent than cotton and tobacco, but agricultural mechanization came more slowly. The iconography of the benevolent harvester president as national patriarch and gentleman farmer was well established by the early nineteenth century. Popular prints followed Stearns’s painting including the fanciful harvest scenes of Washington at Mt. Vernon by Nathaniel Currier (1852) and by John Rogers (1859). 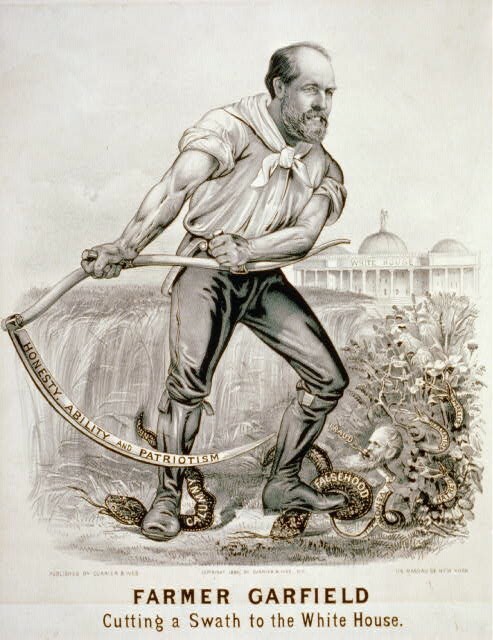 The stereotype of hardworking, noble scythe-wielding agrarian remained a powerful image for nineteenth century politicians who sought to capitalize on public regard for rural rectitude and the patriotic farmer-leader. For this purpose various party organizers designed broadsides with agrarian imagery to promote candidates with campaign prints like William Henry Harrison, the Farmer of North Bend (1840), and Farmer Garfield Cutting a Swath to the White House (1880). The approach apparently reaped the expected benefits as both candidates, and many other seeking other offices, were elected.